“In case you didn’t notice, this is my first time on T.V. — and my last!” — Charlie Kringas, concluding his frank interview on his songwriting partner Frank, in Stephen Sondheim’s Merrily We Roll Along. 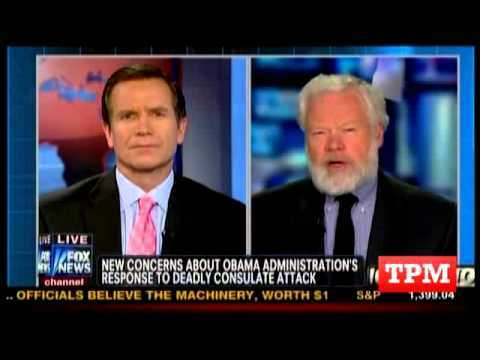 Most of those chortling over Tom Ricks’s highly unusual ninety seconds on Fox News this week were wowed by the way he spoke liberal truth to conservative power, informing his astonished interviewer, Jon Scott, that the Sept. 11 tragedy at the U.S. mission in Benghazi, Libya, had been “hyped” for political reasons, especially by … Fox itself. Then, for an encore, he apprised viewers that their preferred news source “functions as a wing of the Republican Party.” Out came the cane, and off went Ricks. But that was no mere partisan smackdown; it was more subversive than that, and even more bracing. Because as it turns out, Ricks doesn’t want to play on either the red or the blue team, and has no loftier view of Obama-cheering MSNBC than of Obama-jeering Fox. In the derriere-kissing capital of the Western world, little could be less orthodox than indifference to the allure of smiling into the camera, earpiece in place. So the sight of someone going full Will McAvoy on air, letting ‘er rip just like on Aaron Sorkin’s “The Newsroom,” was a mighty refreshing one, and we should hope his plain speaking catches on. In his lead-in to the segment with Ricks, Scott also breathlessly reported that some Republicans were “even expressing concern about a possible White House coverup.” All miked up and ready to weigh in on that, or so Scott thought, was “the author of ‘The Generals.’ He has spent decades covering our military. He joins us now.” But, not for long. His criticism, though, goes far beyond the fat target of the Fox echo chamber. Yes, Fox does present an alternative reality in which Barack Obama does nothing right ever and Mitt Romney was set not only to win but to win in a landslide. The drumbeat it presents is so unvarying that there’s a growing realization on the grown-up right that the network’s actually hurting the G.O.P, pushing it to extremes and pulling it away from mainstream conservative thought. But that an “Earth to Fox” message was calmly delivered by someone who also thinks MSNBC tells only half the story was extra enjoyable in my view, because seeking to please — the lobby, sources, TV producers, or anyone in a position of power — is the root of much wrong in this town. Politicians have a base, not journalists, and if you can’t go up against your “team” on either the right or left, you have ceased to be that. Ricks, whose new book I cracked open this weekend, is in no such danger. Was his televised put-down a planned ambush, I wondered? Or did his harsh but accurate assessment of Fox as a GOP adjunct — and sometimes, adjutant general — just come tumbling forth? He told the young woman who pre-interviewed him that he felt the whole issue had been exploited for political reasons, “but my impression was she’s new to the game and thought that because I’m pro-military — and I do consider myself pro-military,” he’d naturally agree with the Foxified narrative. After three years in the archives researching “The Generals,” Ricks said, “I’m blinking my eyes,” in the TV lights, and taken aback at how much a little truth-telling can set a guy apart around here. But all he wants, he says, is to get back to the little place in Maine where he spends most of his time, writing and occasionally venturing out to see who caught how many lobsters. And did I mention we should all be more like that? Melinda Henneberger is a Post political reporter and anchors the paper’s She the People blog. Follow her on Twitter at @MelindaDC.